Some of my favorite, most sentimental memories of raising my kids for the last eleven (some days seems like three minutes, some days seems like a century) years are those in which we were curled up together at bedtime with a good book. And, like many of you, we've read hundreds of picture books over the years, but it's particularly special when we've gotten to delve into a chapter book together. Reading aloud is, of course, an essential experience for learning to read and for language development. But more than that, it offers both a way to connect to our children, and the opportunity to share an adventure together as we pilot a spaceship that will transport our kids to entirely new and exciting worlds. Who doesn't want to be around for that kind of fun? Here are my absolute favorite read-alouds, with a brief publisher blurb on content. All are appropriate for both boys and girls, and each is presented with the relevant range for interest. These are books that you will delight in just as much as your children, and some might lead to some good discussion about the issues each raises. With others, you'll just get to share laughter and the joy of excellent storytelling. Enjoy! Remember when it was scary to go to school? With over 50 million books in print, Barbara Park's New York Times bestselling chapter book series, Junie B. Jones, is a classroom favorite and has been keeping kids laughing—and reading—for over 20 years! In the 1st Junie B. Jones book, it's Junie B. 's first day and she doesn't know anything. She's so scared of the school bus and the meanies on it that when it's time to go home, she doesn't. Not every parent is crazy about Junie's sassy mouth, but I have to tell you that Barbara Park was a genius at writing material on a very easy level with humor that appeals to kids of all ages. Junie B. is absolutely hilarious, even for adults, and especially when read aloud. Many, many kids can credit their first interest in chapter books to the irrepressible Junie B.
Two-time Newbery Medalist Lois Lowry introduces a new girl in class who loves being the center of attention and tells the most entertaining “absolutely true” stories. There’s never been anyone like Gooney Bird Greene at Watertower Elementary School. What other new kid comes to school wearing pajamas and cowboy boots one day and a polka-dot t-shirt and tutu on another? Gooney Bird has to sit right smack in the middle of the class because she likes to be in the middle of everything. She is the star of story time and keeps her teacher and classmates on the edge of their seats with her “absolutely true” stories. But what about her classmates? Do they have stories good enough to share? From amazon.com: More than 60 years have not dated this wonderfully absurd tale--it still makes kids (and parents) laugh out loud. Poor Mr. Popper isn't exactly unhappy; he just wishes he had seen something of the world before meeting Mrs. Popper and settling down. Most of all, he wishes he had seen the Poles, and spends his spare time between house-painting jobs reading all about polar explorations. Admiral Drake, in response to Mr. Popper's fan letter, sends him a penguin; life at 432 Proudfoot Avenue is never the same again. From one penguin living in the icebox, the Popper family grows to include 12 penguins, all of whom must be fed. Thus is born "Popper's Performing Penguins, First Time on Any Stage, Direct from the South Pole." Their adventures while on tour are hilarious, with numerous slapstick moments as the penguins disrupt other acts and invade hotels. Classic chapter-a-night fun. For nearly seventy years, readers have been delighted by the adventures of Christopher Robin and his lovable friends. Paired with the perfectly suited drawings of Ernest H. Shepard, A.A. Milne's classic story continues to captivate children of all ages. E. B. White's Newbery Honor Book is a tender novel of friendship, love, life, and death that will continue to be enjoyed by generations to come. When the ever-curious Ralph spots Keith's red toy motorcycle, he vows to ride it. So when Keith leaves the bike unattended in his room one day, Ralph makes his move. But with all this freedom (and speed!) come a lot of obstacles. Whether dodging a rowdy terrier or keeping his nosy cousins away from his new wheels, Ralph has a lot going on! With a pal like Keith always looking out for him, there's nothing this little mouse can't handle. From amazon.com: Edward Eager has been delighting young readers for more than 40 years with stories that mix magic and reality. Half Magic, the most popular of his tales about four children who encounter magical coins, time-travel herb gardens, and other unlikely devices, is a warm, funny, original adventure. The "Half Magic" of the title refers to a coin that the children find. Through a comical series of coincidences, they discover that the coin is magic. Well, it's not totally magic--it's only (you guessed it) half magic. That means there's a certain logic to the wishes one must make to generate a desired outcome. Imagine the results emerging from inaccurate efforts: "half" invisible, "half" rescued, "half" everything! What happens when Joey and his sister, Mary Alice—two city slickers from Chicago—make their annual summer visits to Grandma Dowdel's seemingly sleepy Illinois town? August 1931: Joey and Mary Alice help Grandma trespass, poach, catch the sheriff in his underwear, and feed the hungry—all in one day. And there's more, as Joey and Mary Alice make seven summer trips to Grandma's—each one funnier than the year before. In the tradition of American humorists from Mark Twain to Flannery O'Connor, popular author Richard Peck has created a memorable world filled with characters who, like Grandma herself, are larger than life and twice as entertaining. A hilarious Southern debut with the kind of characters you meet once in a lifetime. From amazon.com: Because of Winn-Dixie, a big, ugly, happy dog, 10-year-old Opal learns 10 things about her long-gone mother from her preacher father. Because of Winn-Dixie, Opal makes new friends among the somewhat unusual residents of her new hometown, Naomi, Florida. Because of Winn-Dixie, Opal begins to find her place in the world and let go of some of the sadness left by her mother's abandonment seven years earlier. With her newly adopted, goofy pooch at her side, Opal explores her bittersweet world and learns to listen to other people's lives. This warm and winning book hosts an unforgettable cast of characters, including a librarian who fought off a bear with a copy of War and Peace, an ex-con pet-store clerk who plays sweet music to his animal charges, and the neighborhood "witch," a nearly blind woman who sees with her heart. Part Frankie (The Member of the Wedding), part Scout (To Kill a Mockingbird), Opal brings her own unique and wonderful voice to a story of friendship, loneliness, and acceptance. The Borrowers — the Clock family: Homily, Pod, and their fourteen-year-old daughter, Arrietty, to be precise — are tiny people who live underneath the kitchen floor of an old English country manor. All their minuscule home furnishings, from postage stamp paintings to champagne cork chairs, are “borrowed” from the “human beans” who tromp around loudly above them. All is well until Pod is spotted upstairs by a human boy! Can the Clocks stay nested safely in their beloved hidden home, or will they be forced to flee? The British author Mary Norton won the Carnegie Medal for The Borrowers in 1952, the year it was first published in England. Winner of the 2013 Newbery Medal, this stirring and unforgettable novel from renowned author Katherine Applegate celebrates the transformative power of unexpected friendships. Inspired by the true story of a captive gorilla known as Ivan, this illustrated novel is told from the point-of-view of Ivan himself. 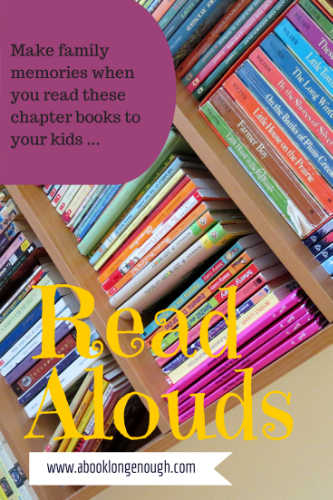 Follow Rebecca's board Amazing Read Alouds to Share with Your Kids on Pinterest.